The CoMP-S and SCD spectropolarimeters at the Lomnicky Peak Observatory as supporting instrumentation to EST. Co-authors: Gömöry, P., Rybák, J., Schwartz, P., Kučera, A., Ambróz, J., Kozák, M., Koza, J., Tomczyk, S., Sewell, S., Aumiller, P., Gallagher, D., Summers, R., Sutherland, L., Watt , A. 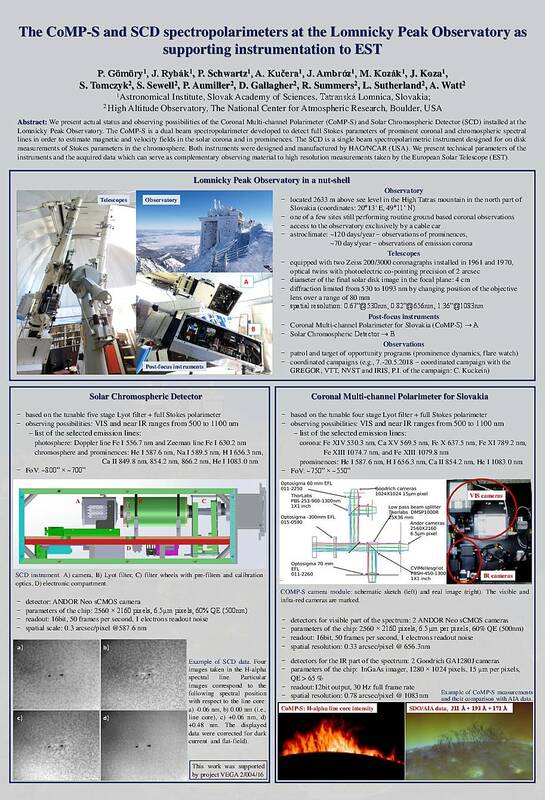 We present actual status and observing possibilities of the Coronal Multi-channel Polarimeter (CoMP-S) and Solar Chromospheric Detector (SCD) installed at the Lomnicky Peak Observatory. The CoMP-S is a dual beam spectropolarimeter developed to detect full Stokes parameters of prominent coronal and chromospheric spectral lines in order to estimate magnetic and velocity fields in the solar corona and in prominences. The SCD is a single beam spectropolarimetric instrument designed for on disk measurements of Stokes parameters in the chromosphere. Both instruments were designed and manufactured by HAO/NCAR (Boulder, USA). We present technical parameters of the instruments and the acquired data which can serve as complementary observing material to high resolution measurements taken by the European Solar Telescope (EST). Do you have problems viewing the pdf-file? Download poster here. If the poster contains inappropriate content, please report the poster. You will be redirected to the landing page.